Prime Minister Benyamin Netanyahu at his home following the 41st Memorial Service at the Herzl Cemetery in Yerushalayim for his brother Yonnie. 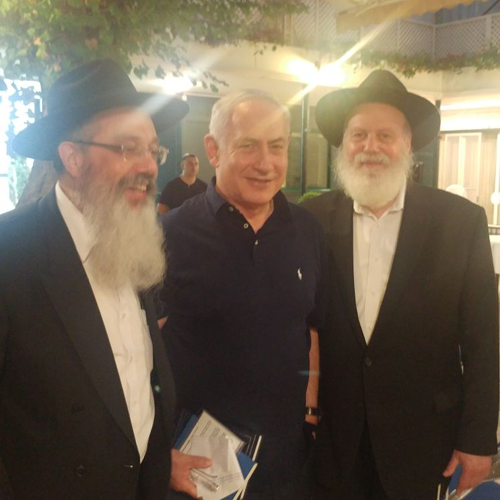 On the Prime Minister’s left is the Director of the Chabad Mitzvah Tanks in Israel, Rabbi David Nachshon. On the PM’s left is Akiva Marshall. 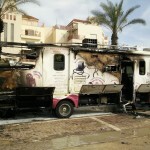 A Chabad Mitzvah Tank in Israel burst into flames Purim day with 40 people inside listening to the reading of the Megilla. 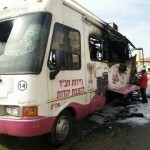 The miracle of Purim brought everyone to safety; however the organization is left with a gaping hole in their operations in Israel where this Mitzvah Tank was charged by the Rebbe to bring Torah and Mitzvahs to the people of Israel. 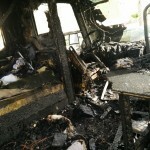 Shortly after the fire Rabbi Dovid Nachshon, the Executive Director, said we cannot give up and he immediately set about buying a new Mitzvah Tank. 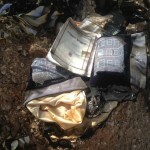 The cost to purchase and prepare and place it in Israel totals $250,000 USD. All friends of Israel are called upon to contribute.